"I wonder, I wonder, what you would do if you had the power to dream at night any dream you wanted to dream." Future Park has debuted a trailer for an intriguing indie film titled Zen Dog, which is actually not about a dog (unfortunately). Zen Dog premiered at the Raindance Film Festival in the UK back in 2016, and played at a few fests last year, but it is only now getting a release some two years later. 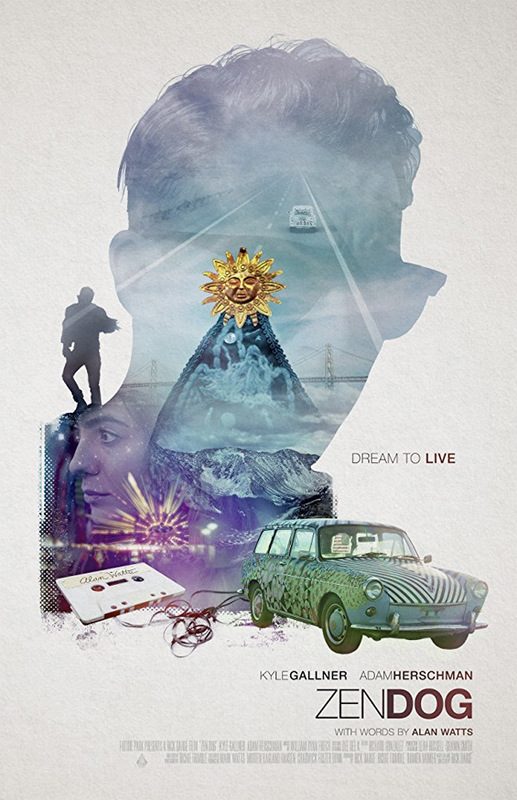 Trapped by daily routine, a man experiences complete freedom by dreaming himself across the country in a psychedelic VW with the guiding words of philosopher Alan Watts. Zen Dog stars Kyle Gallner as Mud, along with Adam Herschman, Celia Diane, Clea DuVall, and Devin Finch. This looks a bit too odd and too psychedelic to be good, but I am most curious about the Alan Watts recordings used in the film as a guide. Check it out. Mud (Gallner) has been trapped in his daily routine for a long time. He runs a struggling virtual reality startup that promises to transport users to exotic locations from the comfort of their homes. Plagued by nightmares of a stranger's suicide, Mud has a difficult time coping with his monotonous existence. One day, his eccentric cousin Dwayne (Herschman) shows up at his doorstep, and introduces him to the power of lucid dreaming with the hopes that it will quell his nightmares. Thus Mud dreams himself into a road trip across America in a psychedelic Volkswagen. Finding himself experiencing a life without the usual comforts and meeting colourful characters, he starts discovering more than he initially bargained for. Zen Dog is written and directed by filmmaker Rick Darge, a cinematographer making his feature directorial debut after a few shorts previously. This first premiered at the Raindance Film Festival in 2016, and is just now available this year. Future Park will release Zen Dog direct-to-VOD starting June 22nd this summer.